I’m sitting in the Sevilla airport all alone. It’s 7:40 in the morning, and possibly my favorite time to fly. Watching planes take off the runway from wide windows, it is peaceful and quiet. Although I woke up in my apartment this morning, I will fall asleep in Prague, Czech Republic. This is the beginning of a 2 week trip in Eastern Europe that I have been planning for months. Fifteen days from now I’ll be back in the United States having breakfast with my dad, reading with my mom, playing with my friend’s new babies and eating as much American food as I can handle. Monday was my last day at school and it was a good one. I stopped by to see my 1ESO students and they were beside themselves. What do you do when 32 eleven year olds chant your name like a soccer cheer and bang on their desks with their little palms? Me – I laugh. I have enjoyed that class so much this year, and laughing is what we do best. Several days ago they locked me out of the classroom so they could set up a surprise inside. Every student had made a letter or painted one on a shirt and they lined up to spell out: “Kelly We Will Never Forget You ❤ ! !” How awesome is that? I had my last official class with 2ESO and when I came down the hall one of my students was loitering outside the door. I’m thinking no way did he get kicked out already when he sees me and bolts back inside, slamming the door behind him. Suspicious! Sure enough when I open the door the room is dark – until someone turns on the lights and my students leap out from under their desks yelling “SURPRISE!” A Sponge Bob piñata hangs from the ceiling and the board is covered with “no te vaya” and “We ❤ Kelly.” They are beside themselves about the surprise and the enormous basket of candy they have to give me – the ultimate gift from 12 year olds! In most of my goodbyes I’ve said “see you soon” – which will be true if I come to Madrid in the fall. So no tears and no sadness, just a sense of .. I’ll be back in a little while. The same goes for friends here from the US – some of us are taking the same end of term trip and will cross paths in foreign cities. Some of us will meet up in the States over the summer, and a few more will reunite in Spain in the coming year. Walking through the city last night on my way home from the final Final despedida, I take a look around and realize that I love Sevilla. The orange trees and the cobblestones, the Cathedral and my barrio. This comes as no surprise given my long term love affair with Spain and particularly, the South (ya sabes, soy del sur). They have finally opened the garden in Puerta de Jerez and I wonder what it will look like when everything is in bloom. Is that when you know you are truly part of a place – when you consider its future? It doesn’t feel like goodbye when I shut my apartment door and haul my belongings out into the elevator. It still doesn’t feel like goodbye when my friend drops me off at the airport. Here in the waiting area I’m more concerned with the cute guy a few rows away than I am with the fact that my year in Spain has come to an end. For this reason I am certain that it is “see you soon” and not “goodbye forever.” Spain could not get rid of me if it tried. I’ve been thinking that maybe Andalucian Spanish is cut so short in syllables and letters simply because it’s too hot to talk so much. It’s a miracle I can talk at all when the Sevilla sun creeps into the city and bakes it dry. Our apartment responds like an oven and gets hotter as the day goes on. Our laundry dries in approximately 2 hours when left outside on the drying rack (a miracle after this humid winter of 3-4 day drying cycles). And what do I do? I melt. Now for an East Coast girl who doesn’t like the heat, I’ve been commenting on the temperature since April. Only now that the native Sevillanos are starting to complain am I reassured that everyone else is equally as miserable as I am. I thank my lucky stars that I will not be here in “the summer” – that is to say July and August. I remember searching for an apartment with my roommate in late September in 100 degree heat .. I have no desire to repeat such an experience! Once you add the levante winds from the Sahara, there is no escaping. Paulo Coehlo wrote that the levante brought the Moors from Spain, but it is sure to drive this girl back to the States in the summer months. Since mid April we’ve had some temperatures that convinced me there is no Spring in Sevilla. The season may exist but on the thermometer you can rest assured there is no real in between. One day it’s raining and the temperature settles in the 60’s – the next day it’s still 83 degrees at 6 in the evening. 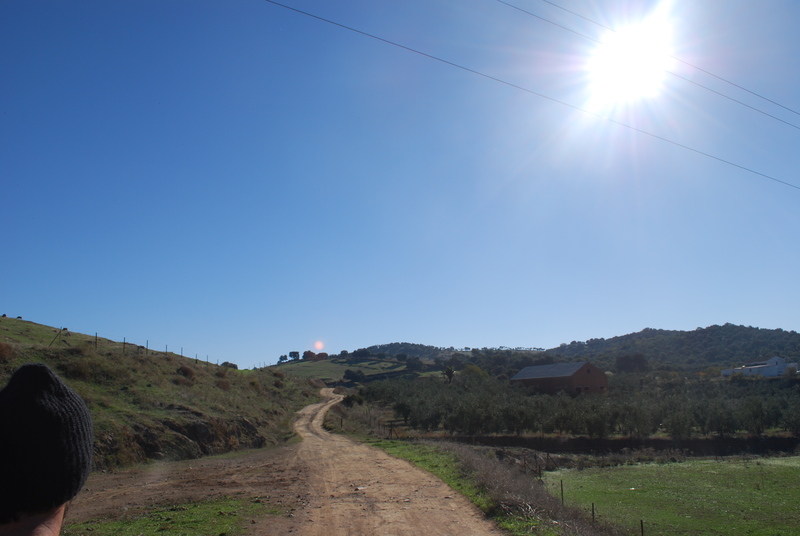 The amount of sunlight we receive here in Andalucia is shocking. When I wake up to go to work the house is blissfully cool and the sun is just starting to lighten the sky (sunrise is currently 7am). Fourteen and a half hours later at approximately 9:40 pm, the sun slides down behind our terrace. The hottest point of the day does not come at high noon but at 4 or 5 pm, and the city simmers well into the night. Siesta lengthens by several hours and you simply cannot leave the house between 2 and 7 pm. A mere 1 hour east of Sevilla lies the town of Écija, Spain, a place which is affectionately referred to as the sarten de Andalucia or the frying pan of Andalucia. Without fail every year local bars prepare huevos fritos a la calle and fry eggs outside simply with the heat of the sun. But as the old men in the interview say: “Estamos acostumbrados” or we are accustomed to it. I wonder how much ice cream is consumed in these dog days of summer? * side note. I drafted this in a fit of heat rage. Today is frescita and beautiful .. my last day at school! Thank you, Sevilla, for this glorious despedida del tiempo! This past Sunday I went with several friends to my first bullfight or corrida del toros here in Sevilla at the Plaza del Toros de la Real Maestranza – reportedly the most important place to fight in Spain. The venue itself is stunning, and was constructed in the 17th – 18th century. It is oval shaped, as opposed to the traditional circle, which I’m told gives the matador a slight advantage when running from the bull. When my parents visited in March, we toured the museum and I was eager to go back and see it full of people and pageantry. What we saw was a novice bullfight, or a Novillada con Picadores. There were three matadors: Víctor Barrio, David Galván and Vanesa Montoya. Our first surprise was their youth. Barrio is 24 years old – also the tallest and most experienced with 26 novilladas and 56 orejas* (ears) to his name. Galván is the youngest at a fresh faced 19 years old, with 13 novilladas and 20 orejas of his own. Montoya is the oldest and indeed a female, and she is my age (27) – this was her debut con caballos (with horses). The fact there was a female matador was another surprise. I was curious enough to do some searching online about this phenomenon and was pleasantly surprised. NPR did an interview in March with matadora Lupita Lopez who reportedly joins the ranks of merely four professional female fighters. Likewise, LIFE magazine did a photo series called Female Matadors: A Fierce Beauty that does a great job of showcasing these strong women bucking a machismo trend. Here are some of the basics of the fight we witnessed. There were 6 bulls, ranging in weight from 449 kg to 496 kg. That’s between 989 pounds and a whopping 1,093 pounds. Each matador fights two bulls. The drama begins with the pomp and circumstance of the Real Maestranza, where all of the fighters enter the bullring with their fighting companions. These companions include picadores (fighters on horseback who use a lance to weaken the bull), capeadores (fighters on foot who work with the capes to distract the bull) and banderilleros (fighters on foot who use two short sticks to stab the bull at the base of the neck). The bull is let out of the gate across the arena from the fighters. The capeadores distract the bull and it takes several passes around the ring. The matador also takes a few passes with the bull to get the feel of it, and judge its actions. Picadores enter on heavily protected and blindfolded horses, with lances in hand. They provoke the bull to charge the horse, and use a lance to stab the bull – twice. Once the horsemen leave, banderilleros enter the ring with wooden sticks, or barbed darts. They provoke the bull and sidestep at the last minute, stabbing the bull with two darts each – this happens three times. Finally with the last stage called the suerte, the matador begins to work with the bull. First s/he raises his hat to dedicate the kill to the person presiding over the fight, a person in the crowd or the crowd at large. We got to see one of the fighters throw his hat in disgust, and one of our fellow spectators informed us that if the bull is not a good one, the matador will refuse to dedicate it because it has not been a good fight. Some say that if the matador’s hat falls a certain way, it indicates bad luck – bullfighters are reportedly very superstitious. Wouldn’t you be? Each fighter has a slightly different stance and posture, although each exuded confidence and bravado. The tallest fighter, Barrio, introduced us to a successful paso where the fighter taunts the bull with the infamous red cape, and succeeds in standing still while the bull passes incredibly close to his / her body. When this is executed well, the crowd shouts “Olé!” Other than these shouts, the majority of the fight is conducted in silence – a code of conduct is enforced and although the crowd is full of both tourists and Spaniards, the fight is taken seriously by all. Numerous pasos take place before the matador reaches for his sword. He faces the bull and attempts to make a clean stab into the back of the neck – into the vertebrae and down into the heart. Unfortunately the female fighter had some trouble with this and we had to watch several uncomfortable minutes at the end of both of her fights. The crowd became restless whether from disgust or disappointment and the old men gestured to each other in frustration yelling “con fuerza hija” (with force, girl). The matador’s companions will come forward to deliver the death blow after the bull has fallen, and the horses arrive to give the bull a circle around the ring before pulling it outside. The bullfight was fascinating and at times, gruesome or terrifying. I was not a fan of how the horses were nearly flipped by these 1,000 pound bulls, although they appear to be well protected. Equally, I wasn’t ready for the fierceness of the bulls – several pawed the ground before a charge and were faster than I could have imagined. Aside from the botched death blow by the female matador, we saw the youngest matador thrown high into the air by the bull. Being so small, he fit directly between the bull’s horns and at one point the bull caught his hip with a horn and sent him cartwheeling into the air. He somehow bounced right up off the ground and continued to fight both valiantly and successfully. Yes I know bullfights are cruel for the bull, but it is something deeply rooted in Spanish tradition and history. Seeing a matador face down a 1,000 lb animal with his suit (traje de luces) sparkling in the late afternoon sun is something special. Watching these young Spaniards take control of a bull while remaining composed and confident is incredible. While I may not see another fight any time soon, I am very glad I took the chance to see one here in Sevilla. Y aqui algunos fotos … olé! *Orejas are awarded when a matador fights extraordinarily well and the official presiding over the fight offers him the ear of the bull. Where do they put these things – on the wall? Gross. Early last week while out having drinks at our beloved 100 Montaditos, someone mentioned a scavenger hunt in Sevilla. This idea quickly morphed into a full blown fiesta, with plans for Saturday night. On Friday a small group gathered at our piso to make suggestions ranging from stupid to outrageous to downright impossible. Saturday dawned with a feeling of competition, and the promise of a big Mexican lunch cooked by several friends. take a photo with a señor / señora (+5) .. Simo found an old lady sitting on a bench and Jen had to convince one guy, but another demanded a hug after seeing the first take with the other guy. find 5 different NO8DO symbols (+5) .. as seen on a manhole cover, building sign, magazine stand, street sign and bike rack. photograph a matching pijo family (+2) .. worth less points because they are everyone. Many Sevillano families participate in this bizarre trend where the whole family dresses alike..
ride in a horse drawn carriage (+2) drive a horse drawn carriage (+5) .. why settle for riding in the back when you can hold the reins? dress up at a souvenir shop (+1 per article of clothing) .. Ivan in an apron, holding fan and castanets, wearing a flower and carrying a bag. Check! trade shirts with a stranger (bonus for runner) (+10) .. we encountered a large group of Frenchmen and one in particular with a stunning blue button down with very patriotic white stars. And a mullet. He unbuttoned his shirt at the mere mention of clothing and slid into Ivan’s Betis t-shirt with a smile. He also passed off the wig and the aviator sunglasses for a priceless set of photos. team member in the drivers seat of a taxi (+5) .. on a roll a few steps away from the Frenchmen, we coerce an old guy out of his cab and put Arely in the front seat. photo behind a bar with a leg of jamón (+4) .. turned away for sanitary reasons at 5Jotas, we roll to good old Meson Serranito for a photo approved by bartenders and patrons alike. Mmmm, ham. all but one team member in the Guadalqivir River (+10) .. in true team spirit, my team passed off their cameras and stripped down to their underwear to hop in the river that runs through Sevilla. Down to about 30 minutes to go, we are in Triana, approx 15 minutes walking from our final destination in centro. videotape a Trianero explaining why Triana es la leche (+7) .. an easy one to do, but made more awesome by the fact a soaking wet Jen sits down next to a fisherman to ask why exactly Triana is the best barrio (we all know its true). take a shot on Calle Betis (+3) .. at the home for all foreigners, we take a shot of tequila while the girls drip river water on the floor. picture of La Giralda from a terrace (not a team member) (+7) .. we sprint into a riverside restaurant and up to the terrace before the waiters can harass us for our rudeness. What? this is Spain after all. Dodging the aforementioned religious procession we sprint to a Sevici stand and make our way back, most assuredly arriving late. On the way we photograph a SMART car parked perpendicular to the curb (+3) and I take a photo in a jungle gym (+2). With the most transportation difficulties ever (flat tire, two people on a bike, crash) we arrive ten minutes late and sweating like pigs. Due to the time penalty we are not so victorious, but we have a damn good time. Cheers to you, friends, for a job well done!